YOUR FORKLIFT HAS BETTER THINGS TO DO THAN STACK OR DESTACK PALLETS! 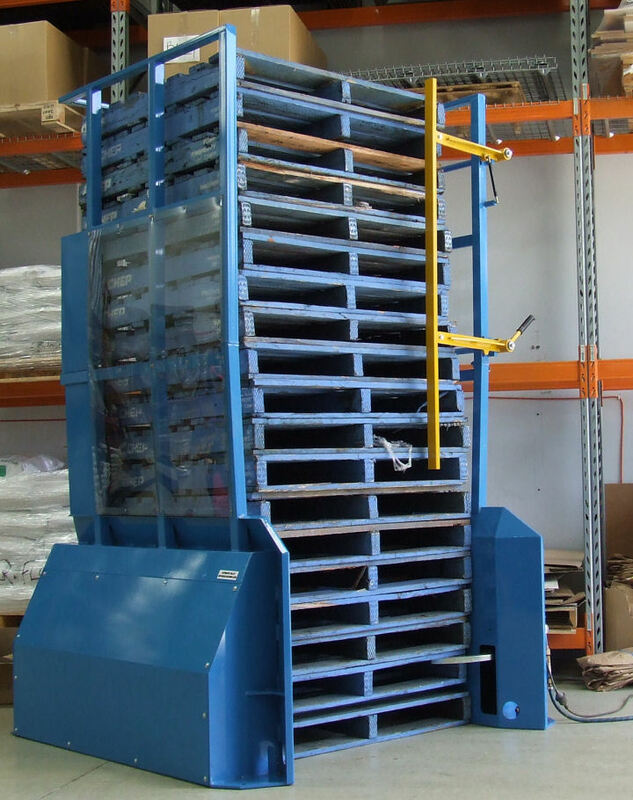 Can accumulate (stack) pallets brought to machine by pallet movers. 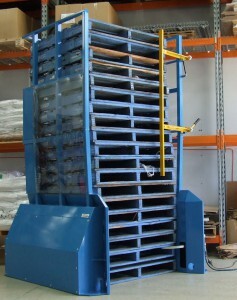 Can dispense pallets from the stack – pallets taken by pallet movers. Suitable for use with both hand and powered pallet movers. Pallet stacks can be loaded by counterbalanced forklift or pallet jack. Cycle time is 15 seconds – that means 4 pallets can be dispensed or accumulated every minute. 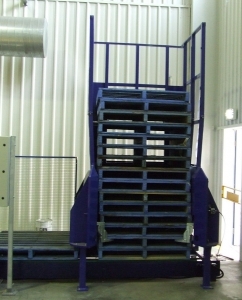 Pallets sit directly on the floor, so there is no ramp or bump to impede pallet movers. Cycle controlled automatically by PLC – no operator input needed. All functions can be performed in manual mode if required. Can swap from Dispense mode to Accumulate mode by one touch of the screen. 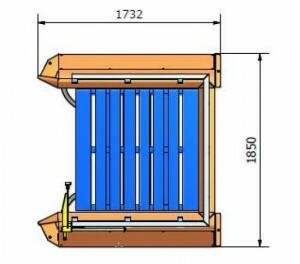 Stack safety gate easily opened by hand (in machines up to 20 high) or pneumatically (in machines 25 and 30 high) to facilitate loading or unloading stack. Automatic operation is halted if safety gate is opened. High quality, heavy duty construction, with powdercoat finish. 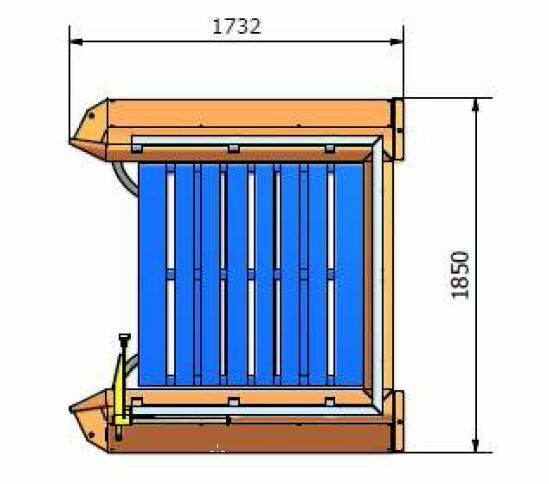 Can be optioned for a stack height of 10, 15, 20 or 25, or 30 pallets. Pallet magazine sheeted in Lexan to protect personnel and allow vision of the stack. Quality components used throughout – Festo pneumatics, Omron electronics. 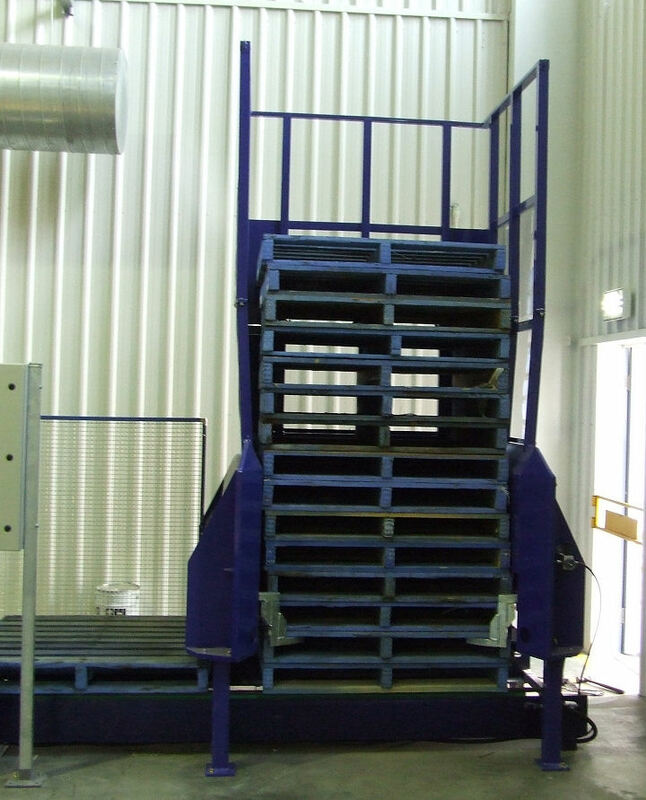 Some of our machines have been in service for nearly 10 years, with minimal maintenance required. We have made over 60 of these machines. This video shows the Accumulator function of the machine. Dispensing pallets is the reverse.